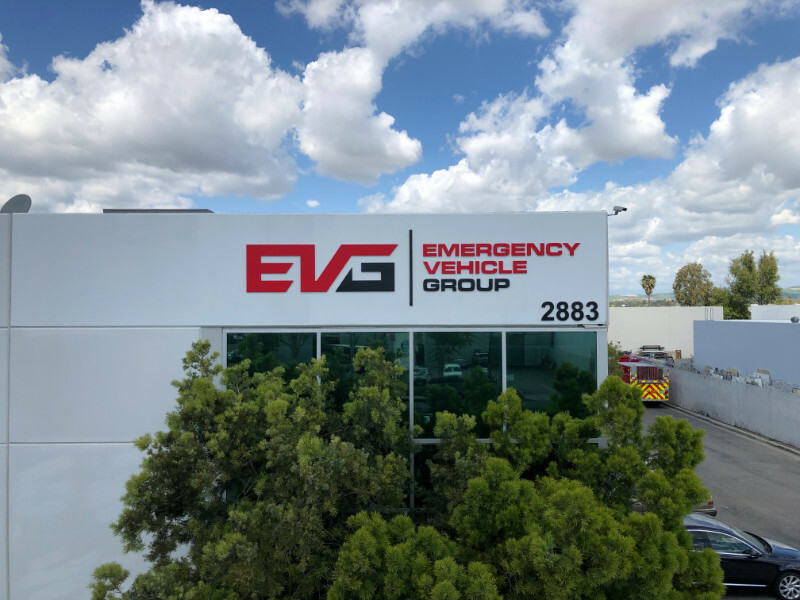 Located at 2883 East Coronado Street, Emergency Vehicle Group, Inc. (EVG) is in the business of providing first responders with high-quality vehicles that meet the unique needs of the various branches. Examples include fire engines, ambulances, and law enforcement specialty vehicles. The company also provides parts and service. 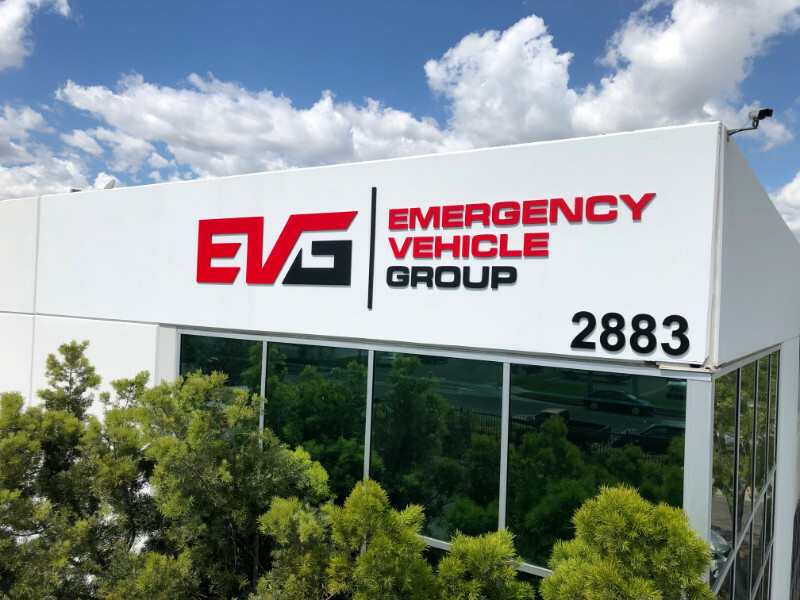 When EVG decided to redo its logo, a management team representative contacted Superior Signs and Graphics for Assistance. 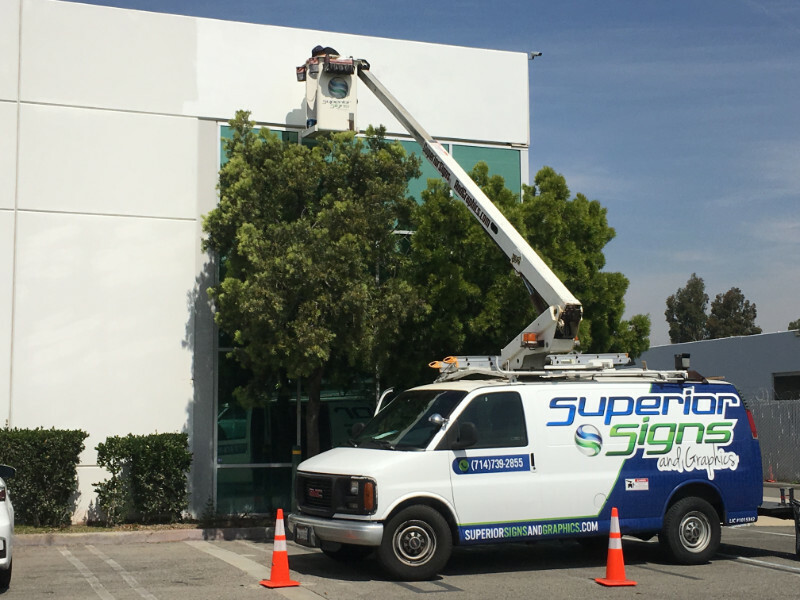 Did you know that the Orange County business community is looking to PVC more and more frequently when ordering corporate signage? Ideal for lobby signs as well as building markers, PVC is the kind of material that weathers well and lasts for a long time. Because it is a polymer, it has a little give, which is ideal for any installation. Similarly, it is lightweight, which prevents damage to walls. Most importantly, PVC is paintable and also does well with printed vinyl overlays. Therefore, you can use it when your corporate persona features gradient color changes. Just as is the case with acrylic and metal, we can create signage with depths of up to one inch. (If you want to go past this thickness, we recommend the use of sign foam.) Best of all, you can choose to have most of your signage needs met with PVC. This is an excellent way of beginning a brand conversation outside and continuing it on the inside. Installing the new sign with our aerial bucket van! We worked with the team to identify its logo design needs. Considering that the old building sign at the location was well past its useful life, it was the ideal time to review the rebranding. After putting together the new look, our technicians began removing the old building sign. At that time, we noticed a degraded foam street number, which we also took down. At the same time, technicians at the shop put together a half-inch-thick PVC sign that they painted with the firm’s custom logo colors. We also did half-inch-thick PVC replacement street numbers. The material is ideally suited for the harsh Southern California sunshine. When installers mounted the signage, they relocated the street number to the lower right-hand side, which allows far more space for the logo sign. 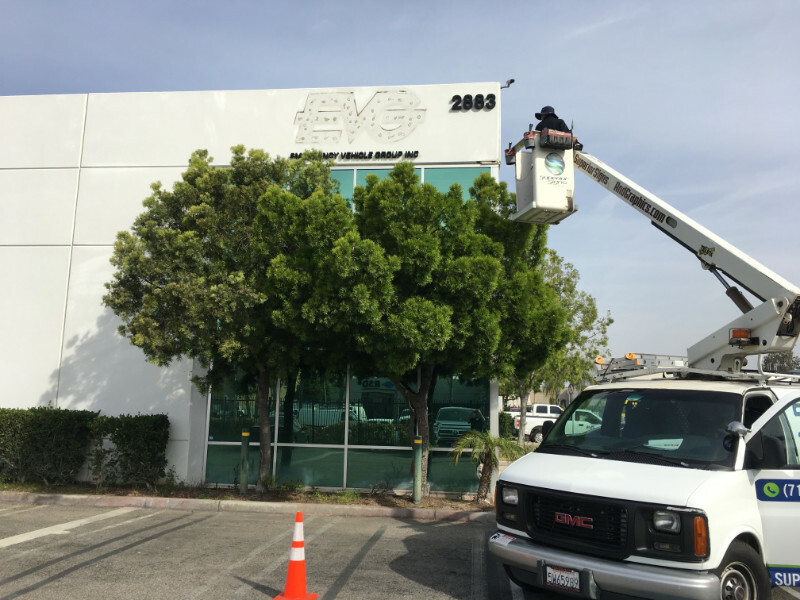 Now, both signage components display prominently on EVG’s façade. By boosting the size of the markers, they are far more visible from far away. Most importantly, they have a contemporary appearance that goes perfectly with the company’s brand message. Ready for a new building sign? If you are looking at the sign on your façade and are not impressed, we can help. Entrust our team with the design, manufacture, and installation of a new building sign. Whether you choose PVC, acrylic, metal, or molded plastic, we can assist you. If you are amid a rebranding consideration, we gladly also help with the change of the logo, font, or color selection. Contact us today to find out how to get started on the process!